FITS ALL BREEDS AND SIZES - The length is suitable for large and small cats. The excess length of the collar can simply be cut off. Kills fleas and ticks, repels mosquitoes and over 300 other types of insects. Condition is New. 🚫REPELS AND KILLS FLEAS, TICKS, LICE, AND MOSQUITOS –Safe and natural flea collar is designed to repel and kill all pests that could cause any harm to your cat. ✅FITS ALL CATS AND SIZES – Our collar is built to be used for any sized cat.Simply adjust the collar to fit the length you need and cut off any remaining length. And don't worry if the collar is too long to your pet as the collar can be cut to fit him/her. DEWEL Cat Flea Collar is safe for human and cats/dogs. Use with pets at least 8 weeks old. Consult veterinarian before using on pets that are sick, elderly, or pregnant. Adjustable size: 33 cm collar for small dog and cat. Hypoallergenic: Take so non-toxic, healthy materials and add a non-allergenic ingredient, don't worry about pet allergies. 3.Long-lasting protective: Normal conditions, this product up to eight months (even in water). This product is EPA approved and has no expiration date. EPA & USA PRODUCT. NO ALLERGY. The effect of our flea collars are based on the protective properties of herbs. The flea tick collar is safe and does not contain components that cause allergies in cats. FLEA AND TICK PREVENTION FOR CATS. Hold applicator tube in an upright position. Pull cap off tube. Turn the cap around and place other end of cap back on tube. Twist cap to break seal, then remove cap from tube. Part the hair on the neck at the base of the skull until the skin is visible. 1 × Flea & Tick Collar. This flea and tick collar can give your cat the ultimate shield protection against fleas and ticks for 6 months. And it is easy to use, just place around cat’s neck then cut to fit. Sergeant’s Gold. Sergeants Gold flea collars. For cats over 12 weeks of age. Says - kills fleas, flea eggs and flea larva for up to 6 months. 3 boxes or 3 flea collars. Immediate payment preferred please. Be sure to add us to your saved sellers list. Thank-You For Looking! International Buyers – Please Note: Import duties, taxes, and charges are not included in the item price or shipping cost. These charges are the buyer's responsibility. Please check with your country's customs office to determine what these additional costs will be prior to bidding or buying. 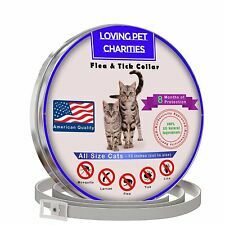 This flea and tick collar can give your cat the ultimate shield protection against fleas and ticks for 6 months. And it is easy to use, j ust place around cat ’ s neck then cut to fit. 2xExcelvan Waterproof Flea Tick Collar for Cat. New flea and tick collar for cats. All natural ingredients 8-month protection. 13 in Long. They are convenient to use and go wherever your pets do. Where applicable, electronics and plugs work with standard US 120 volt, 60Hz outlets, unless specifically stated otherwise, above. Bully Sticks for Dogs. The collar remains effective against adult fleas and ticks for up to 4 months, even when it gets wet from rain, swimming or a bath. 4-MONTH FLEA, TICK & MOSQUITO COLLAR Pink Nylon Neck Strap for Cat. Long-lasting protective: Normal conditions, this product up to eight months (even in water). Adjustable size: 33 cm collar for cat. We will try our best to resolve the problem. We will work with you to resolve the issue.